• Preheat the oven for at least 10 minutes. • Cook roasts fat side up on rack in shallow roasting pan. • Use an instant-read thermometer. Insert halfway into roast, making sure not to touch bone. • Do not add water. Do not cover. • Allows allow roast to rest 10 to 15 minutes after cooking before slicing. Cover loosely with a tent of aluminum foil. • Slowly brown beef on all sides in small amount of oil in heavy pan. Season beef, as desired. • Add small amount (1/2 to2 cups or 118 to 473ml) of liquid to pan. Bring to a broil; reduce heat. • Cover tightly and simmer gently over low heat on top of the range, or in a preheated 325°F (163°C) oven, according to chart or until beef is fork-tender. • Trim excess fat to avoid flare-ups while grilling. • To test the temperature of the coals, hold your hand over them (where the meat would be). If the heat is so intense that you must pull away in 3 seconds, the coals are hot. Four seconds indicate medium heat. • Using tongs, turn the steaks halfway through cooking time. • Add extra flavor by making a pouch of wood chips in aluminum foil. Pierce the foil (to release the smoke flavor) and place the pouch on top of the coals. • Let the steaks rest 5 minutes before serving. • For broiling, place steaks 3 inches (7.62cm) from boiler. • To pan-broil beef, heat a heavy cast-iron or nonstick pan over medium heat for 5 minutes before cooking. • Do not use any liquid or fat. • Season only after meat has been seared. 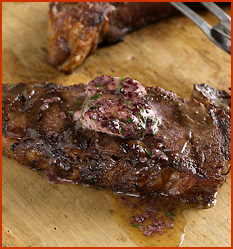 • Turn meat when juices appear in the seared side. • If juices accumulate in pan, pour them off. • Slowly brown steak on all sides in small amount of oil in heavy pan. • Add small amount (1/2 to 2 cups or 118 to 473ml) liquid to pan. Bring to a boil; reduce heat.